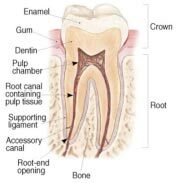 Knowing the anatomy of the tooth helps with the understanding of endodontics. The pulp is the soft tissue under the white enamel and the dentin, a hard layer. 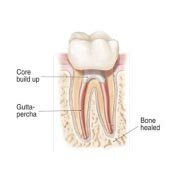 As the tooth develops, blood vessels, nerves, and connective tissue in the pulp help build its hard tissues. Because a mature tooth is nourished by the surrounding tissues, it can survive without the pulp. 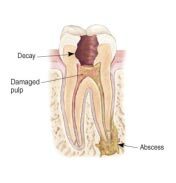 Endodontic treatment is necessary when the pulp contained in the canal of the tooth becomes inflamed or infected—which can be a result of decay, dental procedures on a particular tooth, or cracking or chipping the tooth. 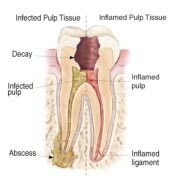 If pulp inflammation or infection is left alone, it can cause pain or lead to an abscess. What are the signs I need endodontic treatment? If you are experiencing pain; prolonged sensitivity to heat or cold; tenderness to touch and chewing; tooth discoloration; or swelling, drainage and tenderness in the lymph nodes, please see your dentist. But be aware that there are sometimes no symptoms. 1. We’ll examine and X-ray the tooth, administer local anesthetic, and place a “dental dam” over the area to isolate the tooth and keep it free from saliva during the procedure. 2. 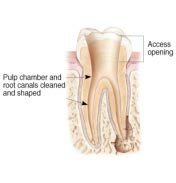 We make an opening in the tooth and clean the pulp chamber and root canals. Then, we shape the space for filling. 3. 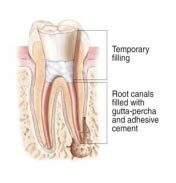 We fill the root canals with “gutta-percha,” a rubber-like material secured with an adhesive cement. We’ll also place a temporary filling, which your dentist will later remove in order to restore the tooth. 4. Your dentist then places a crown or other restoration on the tooth to protect and restore it to full function. 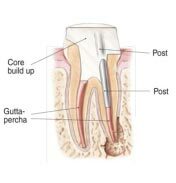 In some cases, the dentist may place a post inside the tooth if there is insufficient structure for the restoration. Depending on the tooth and how serious the problem is, the cost varies. For instance, root canals in molars are generally more expensive. Dental insurance typically covers endodontic treatment and surgery. It’s also important to keep in mind that having a root canal is almost always cheaper and easier than having to replace the tooth. With root canal treatment you not only save your natural tooth, you also save money in the long run. Until your dentist restores it, you should avoid direct chewing or biting on the tooth. Otherwise, you need only practice good oral hygiene. Most endodontically treated teeth last as long as other natural teeth. Occasionally, though, a tooth doesn’t heal properly or continues to be painful. This could happen months or even years after treatment. In such cases, endodontic “retreatment” is necessary to save the tooth.